Doc's daughter Kate sitting in a burnt out tree stump ground blind (Katie's Stump). Lately, I’ve become somewhat reluctant to hunt whitetails in the afternoon. It’s mostly because most our wolf country whitetails 2-1/2 years of age or older have taken to waiting to feed in the evening until it is nearly dark or dark, especially when there is moonlight at sunset. This might be a consequence of all hunters in my camp being able to stick close to older bucks (and other deer with them) from dark to dark, day after day, wherever they are. Likely weary of this and having to be seriously concerned about the possibility of moving dangerously near us without realizing it, they have likely decided the best thing to do when we are around is delay evening feeding until they know we are no longer in the woods. Sure, we take a big buck now and then in the evening, averaging about 15% of the bucks we normally take over a period of years, enough to make it mandatory to continue hunting until one-half hour after sunset each day, but most of the time, evening hunting is boring. For this reason, after a couple hours or so of motionless sitting in the afternoon, I sometimes find myself nodding off, typically waking with a jump just before falling into a deeper slumber. After that, the battle to stay alert and awake without making movements likely to be noticed by nearby whitetails becomes unending and close to being impossible, 15% of my potential hunting success then becoming seriously threatened. Over the years I’ve discovered human snoring can actually attract whitetails, but, alas, I’ve never been able to take advantage of it. My son John has taken a curious buck that was standing ten yards away when he suddenly awoke, but not me. This might sound as if a lot of snoring can be heard in our hunting area in November, but mind you, tales about such incidences come from 70 years of deer hunting. Take the first time it happened to me, I was a teenager. When I suddenly awoke, I discovered two does staring at me about ten yards from the tree in which I was cradled by three stout branches six feet above the ground. They appeared to be yearlings. Their heads were low and each was standing with a forefoot raised to stomp the ground to get me to react in some way that would clear up matters. After a minute or so of this, their tails began fanning out and rising. Figuring they were about to bolt, I began slowly raising my 30-30. Slowly didn’t work. They suddenly streaked past me on my right, the most clever thing a whitetail can do when fleeing from a right-handed hunter. By the time I swung around and got my rifle to my shoulder, they were gone. 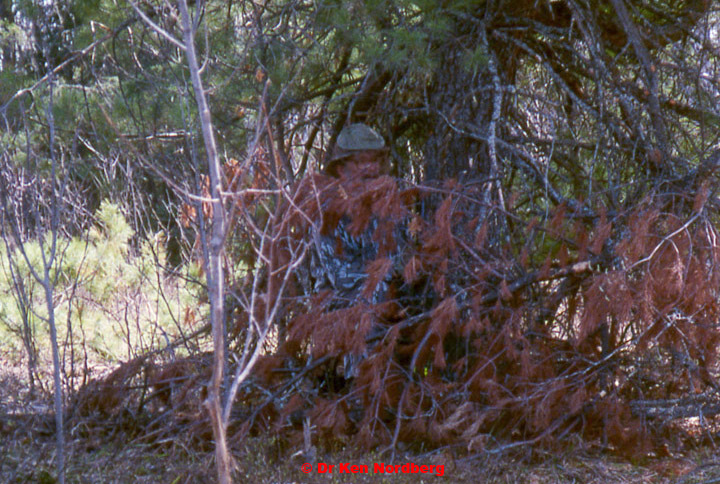 Doc on his stool in a well-concealed ground blind. Some years later I awoke to the sound of an 8-point, 2-1/2 year-old buck coming to a halt on the other side of the pile of dead trees I was sitting behind. I reacted without thinking, grabbing my rifle and swinging it to my shoulder as fast as I could. Fast didn’t work either. I was just pushing the tang on my safety forward when the buck’s second leap carried it into a solid clump of balsams. The most unforgettable of such encounters occurred seven years ago. Upon abruptly waking up, seated on my stool, I found myself gazing into the eyes of one of the largest 10-pointers I have ever seen in the wilds. I tried to keep my wits about me, not moving or blinking. That didn’t work either. The buck had apparently noticed something in my eyes that said “venison eater.” With one great leap, its entire body clearly sky-lighted above me, it landed on its ground scrape 25 feet east of where I sat, at which point my rifle was finally coming to my shoulder. With a twist to its right, however, it took another great leap through intertwined boughs of a solid line of black spruces, thereafter snorting repeatedly (almost as if laughing) as it noisily bounded away unseen. I have never again fallen asleep at a stand site, but not without considerable effort. Number-one on my current list of things to do to avoid making sounds and/or motions likely to be noticed by nearby whitetails is get eight hours of uninterrupted sleep per night in deer camp. A larger barrel wood stove, a sleeping bag good for 20-below-zero, a more comfortable cot and getting to bed by 8 PM made the struggle noticeably easier. Number-two on my list is, get a buck early in the morning. This is the main reason I get up at 4 AM and begin hiking in the dark to my stand by 5 to 5:30 AM, depending on far I must go, thus making certain I get there thirty minutes before first light. We Nordbergs don’t miss a minute of those first three legal hours of the day when we take 85% of our mature bucks. Number-three (beginning late in a hunt in 1990) is, stand hunt at ground level. The stool I sit on is placed silently on the ground amid natural screening cover that masks my silhouette up to my neck. My exposed head is masked by a camo headnet covered by my camo-blaze-orange cap. When in brief motion, camo-blaze-orange looks like a moving branch to whitetails. I’ve taken two bucks for the wall in recent years when my primary screening cover in front was only a six-foot pine. Unlike when sitting in a tree stand, which I did for twenty deer seasons, my ground level screening cover generally allows me to change my position on my padded stool and freely stretch my legs, arms and back (leaning back) without nearby deer seeing me doing it. For elderly me, that’s an enormous plus. Best of all, while doing this I’ve been enjoying the best buck hunting of my life. At this point you might think one of those portable camo tents would be perfect for hiding stretching and other motions while stand hunting at ground level. In our camp they appear promising, but the jury is still out on this idea. We’ve seen several deer and a grandson has taken a yearling buck while using one of three different designs we’ve tried, but we’ve yet to take a 3-1/2 to 6-1/2 year-old buck from one. One thing we’ve learned is, they don’t fool many of our whitetails if not significantly surrounded by natural, unaltered screening cover that breaks up their unique silhouettes. Number–four is, when drowsiness threatens, I chew on a two-inch-long section of red-bark dogwood or other handy wooden stem. This might sound goofy, but it works. Jaw motion when chewing what I call a “fiddlestick,” completely hidden by my headnet, not only magically keeps me fully awake and alert for hours, but it somehow minimizes the urge to stretch as well. I wouldn’t advise chewing on chewing gum or tobacco instead. Their unique odors are powerful where whitetails live, making it easier for experienced deer to identify and avoid hunters who chew them. So, other than wearing clothing that keeps me warm and dry five hours at a time, taking care of latrine duties before heading to a stand site, believing my skill at selecting stand sites means a big buck is likely to step into an opening nearby at any moment and knowing my hunting success as a stand hunter is largely determined by how still I sit and/or how well I hide motions, no argument there, that’s about it.